Nigerians in the Diaspora under the auspices of Nigerians in Diasporas Monitoring Group, NDMG, have stated that the recent call by the Senate for President Muhammadu Buhari to sack the nation’s service chiefs is in furtherance of their ploy to separate the President from his appointees who are diligent. The Nigerians living abroad dismissed the state of insecurity on which the lawmakers predicated their call as a smokescreen, stressing that security breaches that would have been insignificant in the past are now being highlighted for public attention owing to the dearth of more devastating news. NDMG, which reacted in a statement issued on Thursday and signed by its Secretary-General, Uchenna D. Okereke, stated that the disposition of the senators can demoralise troops in the battle front and give Boko Haram terrorists an upper hand. 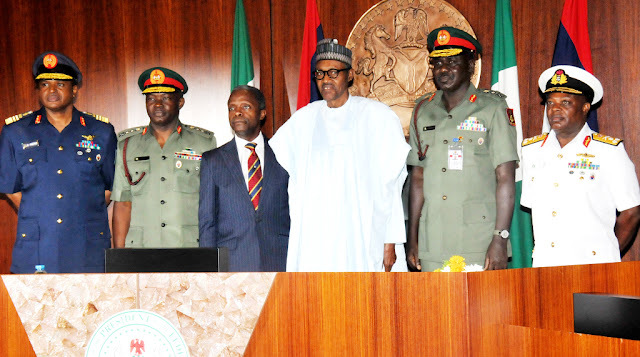 The group maintained that the demand being made by the senators on Buhari is politically motivated and an integral part of manoeuvring for the 2019 general elections, stressing that the senators do not have the capacity to assess the ongoing war against terrorism, and that hiring of experts is not enough to educate lawmakers on the enormity of what the military contend with in the theatre of war. The Nigerians in Diasporas Monitoring Group [NDMG] is dismayed by the demand from the Senate of the Federal Republic of Nigeria asking that the military service chiefs be changed. The security situation in the country, which Senators cited as their reason, is nothing but a smokescreen given their history of continually trying to isolate President Muhammadu Buhari from the performing ones among his appointees. NDMG is saddened that the demand by the lawmakers is premised on anecdotal evidences and not the subject of statistical analyses that would have showed that there has been improvement in the responsiveness to security breaches on the part of the Armed Forces. The reality is that incidences that would have been insignificant in the past are now highlighted for public attention for lack of more devastating news; interpreting this as bad has the tendency to demoralize troops and hand the initiative to terrorists. Coming from lawmakers, who are statutorily expected to use their position to promote peace and stability in the country, we find the demand disconcerting and worrisome. This is especially so when information emanating from certain quarters confirm that the demand is politically motivated and an integral part of the 2019 General Elections manoeuvring. We invite the Senators to take cognisance of their place as politicians who may not have the requisite competences to assess the counter-insurgency war; this is also not a field where consultants can bring the lawmakers up to speed since it takes those in the war theatre to fully appreciate the enormity of what the military contend with on a minute by minute basis. The safety and security of Nigerians is more important than the political gains derivable from maligning the military. We therefore align with the individuals and organizations that had challenged the Senate to come up with legislative interventions aimed at bolstering the military’s capacity to combat the evolving threats facing the country instead of searching for scapegoats. In this, we recommend that the federal lawmakers understudy their contemporaries around the world to understand the kind of support the military requires to combat terrorism. We further challenge the lawmakers to be decisive in charting a course for the future of policing in Nigeria so that the military services can re-focus on their constitutional mandates without the distraction of cleaning up situations that do not require military deployments in other climes. This must concomitantly be backed with realistic budgeting, which a simple comparative analysis with other country will show is totally lacking when what they spend on their armies is considered. While we advise the Senate to walk back its poorly thought out position, we use this opportunity to appeal to the military chiefs and the troops under their commands not to be discouraged by the demand from the lawmakers. They should see the call as a minor skirmish in the psychological component of the ongoing counter-insurgency operation. Nigerians, the electorates who these lawmakers represent, greatly appreciate what the service chiefs have done so far. Nigeria shall prevail against every primordial interest or sentiment by its traducers and become great again for all her citizens in the nearest future. Let us continue to believe and support the performing ones like the current crop of Service Chiefs in our country.